Like most people, you wish to fit a large TV in your home. You probably want to be part of the latest trend, you want the high resolution (4K Ultra HD) or would want to enjoy the many extra features such as Wi-Fi, and Video streaming. Unfortunately, buying a large television set may not be wise at times. It will occupy too much space in your small apartment, studio or dorm room, the price may be way above your budget, and carrying it regularly may not be practical due to large size and bulk. But, have you considered a 24-inch TV? Limited Space: If you live in a studio, dorm room, or a small apartment then you are better off with a 24-inch TV. It’s also a better choice if your room is a little congested or are planning to buy new items. Fitting a very large TV may mean you sitting too close to the screen and this will make the picture less appealing due to the more visible pixels. Regular Mover: Imagine yourself moving with a 60 or 75 inch TV? It’s not only tiresome and inconveniencing but also increases the chances of the unit getting damaged. A TV contains sensitive components that are easily damaged by impact and vibrations. The screen and housing can get dents, chips, or cracks when knocked against other objects. It’s more convenient and easier to move with a 24-inch TV. Budget Conscious: The price of television sets seems to be proportional to the size. The larger it is the more it costs. 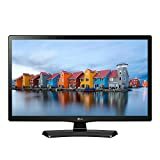 If you are a student, or on a tight budget, or live frugally, then a 24-inch TV is a more viable option. The cost is more affordable and repairing it is also cheaper. Convenience: Due to their smaller size and lighter weight, handling a 24-inch TV is easier compared to larger units. It’s more portable and will gift in small spaces with minimal problems. Furthermore, it can be placed in many places and will still look amazing. You may wall mount it or place it on a stand. This deletion has great picture quality, good audio and is also easy to operate. The screen doesn’t flicker and it also stays cool even after extended running. 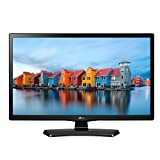 The LG name is famous in regards to quality televisions. 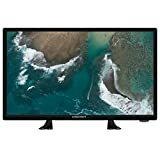 This LED TV is a top seller and is a good choice for small spaces for instance dorm rooms or studios. It has a decent resolution of 720p and produces great flicker-free images for an enjoyable experience. The Full HD resolution plus LED backlighting eliminates flicker and jitter and has a good 120Hz effective refresh rate. The Smart Energy saving television set conserves energy to keep the power bills minimal. Connecting devices such as DVD/ Blueray players, Home Theater, Game consoles is easy with the HDMI 1.3 inputs. Although it’s more affordable than most of its rivals, the craftsmanship and quality are topnotch. It handles bangs, impacts, and vibrations pretty well. If space is an issue then this 24-inch TV is a great fit. 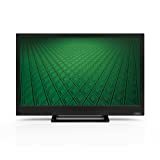 The D24HN-D1 LED TV from VIZIO receives good comments in terms of picture quality, energy efficiency, reliability, and affordability. The Smart LED TV produces brilliant picture via the Edge Lit LED backlight and crisp, clear pictures courtesy of the 720p high-definition resolution. The Ambient Light Sensor adjusts the brightness according to the surrounding while the HDMI port works with most devices. You don’t need to worry about high power consumption since the Smart TV is Energy Star 7.0 rated and is more efficient than most of its closest competitors. This unit has good screen brightness and contrast ratio that eliminates the annoying shadows. It doesn’t have any jitters and complements different decors. The 24-inch LG 24LH4830-PU has an amazing design and looks great in different scenarios. You can use it in your studio, apartment, and dorm room, mobile home, hotel room, and other places. The 720p resolution may not be the highest but the picture quality is quite good. It does not shake, freeze or have “snowy” images. It has a wide-angle screen for better visibility even from angles and weighs less than 8 pounds. The Smart TV has full-array LED backlight to produce uniform brightness and built-in Wifi Direct for watching streaming content online. Other worthy features include the 2 HDMI ports and WiDi & Mira cast for Screen Sharing. The picture and audio quality of this TV are excellent. You won’t see any blurs even when seated a few feet from the screen. Also, the unit’s light uniformity prevents any shadows. With this TV from Element, you get great picture quality (Panel Resolution: 1366 x 768) and also decent sound. In fact, many consumers say there don’t need an external speaker system or amplifier. The brightness is quite good (Dynamic Contrast Ratio: 800:1) even in poorly lit environments. Chances of poor sound or noise are minimal since it has built-in 3D Video Noise Reduction. It’s lightweight and can be placed on a stand, a flat surface, or wall mounted. The TV supports Over-the-air NTSC/ATSC RF Input and the screen doesn’t have lots of glare. The TV has lots of smart features and accessing Pandora, Netflix, Spotify, Hulu and other video and audio streaming services are a breeze. The UN24M4500A from Samsung Electronics is not your ordinary television set. In addition to watching TV and movies, it also allows you to use apps as well as view video on demand. The 24-inch unit also supports social media use and has a very responsive remote for extra convenience. It has a high resolution (720p) for good pictures and a Motion Rate 60 for minimal blurs. The HyperReal Picture Engine works with the LED backlit technology to deliver even brightness free of shadows. The decently sized TV is great for a studio, mobile home, dorm room and other places. It has even brightness and isn’t affected by shadows or flicker. Mounting and using the television set is simple and it is exceptionally quiet. 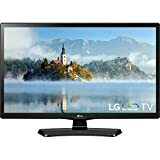 Measuring 21.9(W)x 13.6(H) x 2.1(D) inches without stand, the LG Electronics 24LH4530 is targeted at people looking for a high quality, affordable, and space-efficient product. The LED TV won’t congest your limited space and is easy to mount. It has a slim design and black color to improve the décor of the room. The LED backlight enhances the brightness while the 60Hz Native refresh rate delivers seamless picture motion. It is built using LG advanced technology for long life and can be placed on a stand or as it is. The integrated HMDI 2.0 inputs work with many devices including speaker systems, DVD players, game consoles and home theater. The color, picture, and audio are superb. It feels very solid to handle regular operation and maintains its goodness and appeal for a long period. Just because you have little space doesn’t mean you should choose a basic TV. With the Samsung UN24H4500, you not only get a high-quality Television set but are also assured of the best entertainment. Although 24 inches, this unit has crisp clear images thanks to the 720p resolution and produces good audio via the top grade built-in speakers. The 60Hz Native Refresh rate prevents any annoying freezing and flickering. It saves spaces because of its fairly slim size and measures 22.1(W) x 13.7(H) x 1.9(D) inches without a stand. The 2 HDMI and 2 USB inputs work perfectly with different devices. Buying a 24-inch “telly” isn’t different from other types. You still need to focus on things like available space, mounting ease, smart features, customer opinions, and brand credibility. You can get handy buying tips from this YouTube video below. The above units are the best 24-inch TVs you will find in the market. Their practical size suits them for many places especially rooms with limited spaces. They are a lot easier to handle and carry due to their lighter weight, provide a good viewing experience because of the superior technology, and also have an array of features. We also can’t forget that they are more affordable and also easier to maintain or repair. Finding the best 24-inch TV for your small or congested space is as simple as selecting a unit from this review.